by Brady Wheatley, Dean of Students and Histories Department Head The boxes on the student schedule are deceiving. The schedule looks neat and ordinary, but most of what we do here can’t fit inside a box. “7:30-8:00: Chores”: I sat down with this week’s Caciques, Megs, Michael M, Liz, Noelle, and Peter Kite, and heard their plans for the community this week. I realized that every week I am less and less necessary in the Cacique meetings. Students have taken charge in the best of ways and I am only a supporting member for their ideas. The biggest change is that the Caciques realize what they are capable of. They don’t hesitate to attend a faculty meeting and discuss community needs or organize an event at 6:30 am on what would be a day to sleep in. “9:15-12:15: Human Eco”: Noelle, Liz, Megs, Bailey and Sarah Taft told me excitedly that it was time to put the scallops we had caught under the off-shore aquaculture cage. Knowing wind was coming soon in the week we made the last minute decision to move quickly. We figured out the logistics and hopped in the boat, ready to see if we had solved one of the problems of a previous group’s project. Our group this semester chose to continue to work of previous students rather than start a new project from scratch, a slightly less enticing idea, but one that in my opinion has even more value. 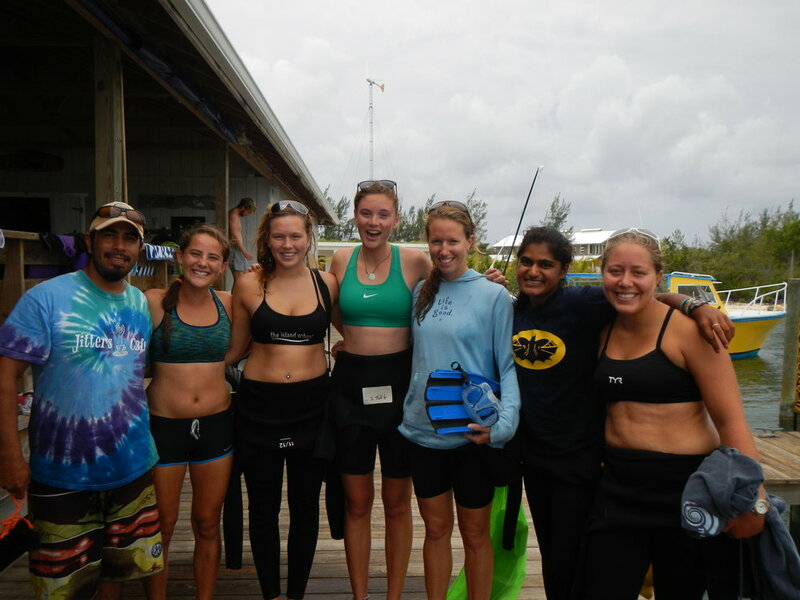 As students a year ago realized, scallops could potentially be farmed in The Bahamas in an effort to filter nutrients in aquaculture systems, and simultaneously provide an alternative shellfish for conch consumption. These five young women decided that following through on previous work could help kick start an even larger project in the region- now we just have to figure out if it will work. Bubbles surrounded us as we sank to the bottom of the ocean floor, almost 90 feet under water. Our group worked effortlessly to move the cement blocks back in place from the Scallop group a year ago. We carefully buried the black pen-shell scallops in the sand and watched the large grouper come close, curious of the new creatures in his home. I remembered all too well seeing this same grouper eat the Amber pen-shell scallops we tried to plant last year. As we resurfaced I hoped that these scallop shells, a different species suggested by the previous group, were strong enough to keep predators out. I love working at a school where students look at me confused and say “but this is really hard.” They are thinking deeply about some of the most important issues in conservation and international development. I love working at a school where students and faculty work together through challenging ideas that matter both inside and out of the classroom. I love working where Literature teachers and dive instructors will suddenly and unexpectedly drop everything that they are doing to come out and support students on a mission. Most of all I love working with students who know that they can change this word. I love working at this school.